Barbara Banes Mitoff's grandparents, Fred and Erma (nee Sharkey) Banes, arrived from Remington, Indiana, in 1921, with children Freda, Mabel, Lowell, and Nason. They camped at Overland Park, where most newcomers set up tents. "Fred was a farmer and carpenter. They moved a few times, then purchased land between South Quivas and South Shoshone." He made his living in Sheridan by building homes and made a reputation for himself and his team of mules by pulling many a wagon or car out of mud holes and cultivating gardens around town. "His daughter, Freda, married Hugo Rider. Their children Lila, Russell, and Vivian attended Petersburg School from first grade through the ninth grade. Mabel married and lived in the Chicago area. Nason married Thelma Ronald" and raised sons "Clinton and Clyde." 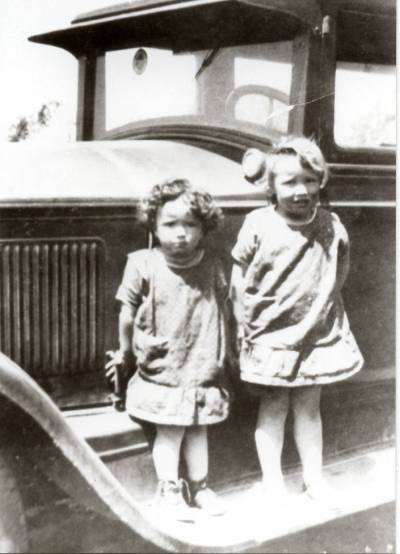 They also lived in Sheridan many years. Fred and his son Nason, "were on the town council in 1938. 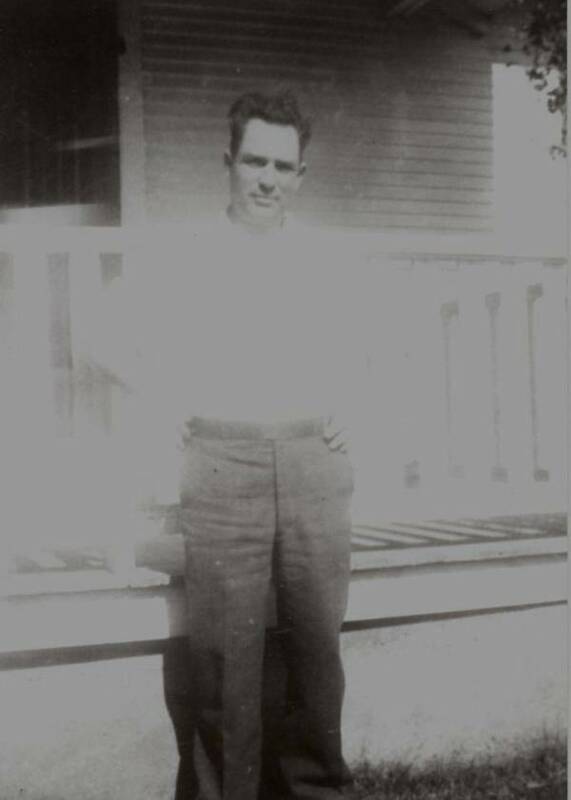 Lowell [Barbara Banes Mitoff's father], helped his dad in the building and farming business" and "in 1924 he married Letitia (Tish) Coggins." Mrs. Mitoff's mother's maternal grandparents, Charles Clinton and Cora Lee Coggins, arrived in the Sheridan area with children Clark, Letitia, Merle and Ray. They camped in a private yard until they rented the lower part of the Wayside Inn at 3550 S. Santa Fe. "In 1926 Charles became town marshal of Petersburg [Sheridan]." The family survived the death of their child Merle, who had an enlarged heart. The other children grew up and settled in Sheridan and started families of their own with other members of the community including "Ray Coggins" who "married Esther Kvale [pronounced Qualey]," daughter of the then proprietors of the "grocery store and gas pump close to Brady Court and West Hampden [on the east side of Brady and the north side of Hampden]," and raised "children Kenneth, Kathleen, Arnold and Norman." Mrs. Mitoff remembers that her father Lowell Banes [shown in picture on the left], moved the family "around a lot as there was little or no work here [in the Sheridan, Petersburg, and Fort Logan area]. He migrated from "Indiana, farming, then back to Sheridan building with his dad. In 1937 my dad built a new house at 3425 S. Quivas. There was no water in the house but we did have the kitchen sink, and a bathroom used for storage." When they had settled, Lowell also went to work in his community "with the city road department off and on" and then serving "three terms on the town council." He was proud of Sheridan. "He defended "Sheridan from being annexed to Englewood or Littleton" which allowed him to watch it grow from a sparsely populated area to a thriving community that has kept its community identity. He continued to serve his community as Street Superintendent until his death. The lifestyle that he defended had a slower, friendlier pace, echoing the rural life of the settlers. Life was "quiet and simple at this period of time. Milk and ice were delivered to our door, telephone was a party line, and radio [only had] two stations. Mrs. Mitoff remembers growing up in Sheridan vividly. Attending school was an adventure back then. "Peggy and I walked to Petersburg School and then to Englewood [High School]. There were few cars on the road at this time. To cross the bridge [a steel arch bridge that was washed away during the 1965 flood], we waited until no cars [were] in sight, than ran across as fast as we could. There was a foot bridge put up on the south side of the road bridge, which was a big help." She "always liked the monthly pie socials held at the town hall on Hamilton Place. We played Pinochle and then had pie and coffee" with "cake and milk for the kids. Most of the people were old timers and members of the fire department. This is where a lot of news and gossip was discussed." "October was always the Halloween Carnival. Mr. Hornbuckle made lots of candy. Sometimes a box supper was held before the carnival started. Getting the booths ready and games set up was a job but fun. There were bean bag tosses, pull strings for a prize, a tub of apples and anything else that was fun but safe. A nickel or a dime went a long way then." "Four generations of Banes, including 'Peggy [Banes] MacDonald' and Mrs. Mitoff's daughter, Delona Miller" have continued to enjoy that lifestyle, all attending "Petersburg School." Her mother Letitia, attended "in 7th and 8th" grade, "Peggy and I finished ninth grade, Peggy's sons, Ricky and Tim," and "my grandchildren, Barbie and Kelly Mitoff graduated from Sheridan High School, and Roy and Dwayne Miller also attended Sheridan Schools." Peggy Banes McDonald remembers "coming from Indiana" and that "it took forever getting here [Sheridan]. At night they made things out of the stars, and in the daytime they watched the clouds and made things out of the clouds." They also slept a great deal to pass the time. 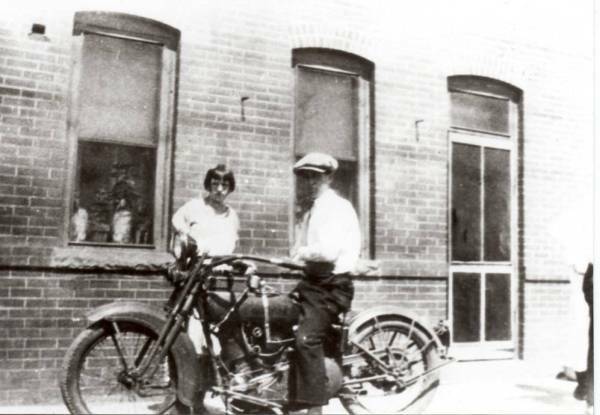 She also recalled "a trip to downtown Denver...to Curtis Street...it took a while," and her father "saying "Be sure you are awake girls, because when we turn this comer, you are going to see all the neon lights and everything. That's when they had the burlesque down there, everything had neon lights. The Tabor Theater was still there, and lots of business down there." She continues her litany of treasures saying, "My dad made our hope chest, one for each of us. I can remember him working out in the garage...sanding; he's got these big boxes...but he never told us what it was. At Christmas there they were." Later when Mrs. McDonald was older, in "late '39 or '40," she took an old street car to "go to a movie, [at] the Paramount...everyone seemed so beautifully dressed. They dressed in those days." She "always admired...men and women, because you know out here [Sheridan] we never saw the dress in the men or the women. She owns many historical pieces including Charlie Coggins' badge, from 1924 -1925, silver and engraved with "C. C. Coggins Town Marshal Town of Sheridan with an eagle at the top and the shield below." She also has "his railroad badge" and a brakeman's light...that they used to swing, with the red and the amber and blue green" light. Charles C. Coggins was foreman on the B & B G #4 Rock Island Railroad. She is proud of her sons' accomplishments and mentions that Tim, "her younger son is working in Burbank in the [Walt Disney] corporate office in computers," and Rick is a deep sea diver back in New Jersey, working off Manhattan right now. Her reminiscences include neighbors. Many residents of "The Bottoms" will remember "Ed Thornton [a former mayor] and his wife Norma's, house was on [Keeson's] land. The Tweeten's, Maud and Alfred are still over there. [The] Baumgartner's lived behind the old fire house. "Dad owned the garage house, and where Sample's bought." Time marched on and "Keesen's bought Samples, and then bought Thornton's. The train line is fairly close back behind there. It still comes down to service the area businesses." The fateful Petersburg school picnic where Aubry Ditch fell to his death was discussed in a previous edition of this program book [see Tucker Family], was attended by Mrs. McDonald, who witnessed the accident. She was watching them walk across the ridge, and saw him tumble. She went to the 9th grade, graduated and then went to Englewood High and graduated in 1946. She remembers the Petersburg School, and "some cabins in there between the school and Santa Fe and a restaurant." "Dad had a floor laying" business and a truck that said "Bane's Floor Laying." He worked throughout Colorado and adjoining states. Like her sister, Mrs. Mitoff, Mrs. McDonald remembers her "grandpa and his mules. I remember staying in that little house...and telling the weather by the mules. If they were standing with their back ends towards the west and their ears down, it was going to be a storm, or if they were playing around ...the weather would be nice." not want to leave everything. He said to me 'You don't have any problem, you have everything you own in your car. You are still packed." So I said, "Dad if it will make you feel better, I will throw it all in on the bed or wherever." So he said if I did that he would go, so I did. brown trim. Mostly what happened was that it was just tipped, and cracked." The houses were stained and difficult to clean. "The mud just soaks right in." We "ripped all tile mop boards off the house and disinfected everything...it was damaged quite a little bit, but my dad being a carpenter...put it back together." Her remembrances of school were that her "mother went there when the Petersburg school was held in that little church [north of the school property on Natches, and was a Mission church.] It was called Petersburg, but it was in the church. When the school was built, she went there, and was there when they had the fire. She remembers when her father "was on the Volunteer Fire Department," and "when Loretto Heights was on fire; the building behind where they had all the little kids...we all ran as fast as we could to the noise and confusion." Her father gave them this bit of advice in case of fire, "Now look, if you ever have a fire, think ahead, and when you put your clothes in the closet, don't put one hanger, that way, and one hanger this way...the firemen can save the clothes, [if they all hang the same direction] otherwise they are not going to bother. Ironically, "when Dad built these houses it was not for a lot of clothes. He said 'you have three outfits; one you are wearing, one is your good one, and one is your change one." "Emma Sharkey was his [Lowell's] mother" and "married Fred Banes. Job Banes was his grandfather and Emma Stephens was [her] grandmother. I remember going to his farm and he had a sister Freda Ann. Freda worked at the school doing the lunches for many years, at Fort Logan. Freda married Hugo Lawrence Rider, and Mabel Banes married Roy Edward Novak." "Lowell Banes married Letitia Etheldra Coggins." Children born to them: Lawrence Eugene Banes was stillborn, Barbara Lee and Lois June Banes. When "Lois...was a little girl she always had a dirty face, a little round face, and they called her Piggy, and the kids thought that her name was Peggy, because no parent would call their child Piggy, but hers did. Not many people know that her name is not Peggy. "Nason Owen Banes was Lowell's brother, and he married Thelma Mae Ronald; Clinton and Clyde were their children." She remembers that "the Isaac Walton camp grounds were on the east side of the river down from the bridge on the north side of Hampden, north of the drive in movie screens. She also remembers the infamous "Wayside Inn, and prohibition" as well as the "tunnel [that] led from there to the river, so the ladies of the night could escape." The tunnel was also possibly an entry point so that "alcohol could be brought in and taken out." She remembers the wall that hid a room, about two feet wide, so cases could be stored there. This was a bedroom at that time.